The whale watching season has started on Queensland’s Gold Coast but if you think it might be too early to see whales then think again. It was the second day of the season and unusually a bit bumpy – twice before doing whale watching tours here from Surfers Paradise the sea had been calm. It was worth the rock and roll on the way out when we came upon a ‘competition pod’ – a group of up to ten humpback whales that stayed close to the surface and circled near the boat. The males, identified by the scars and scratches on their backs from previous battles, were vying to be the chosen suitor for the female humpback who seemed more interested in avoiding all of them. This phenomenon of a competition pod is rarely seen – perhaps once or twice in a season confirmed the captain. 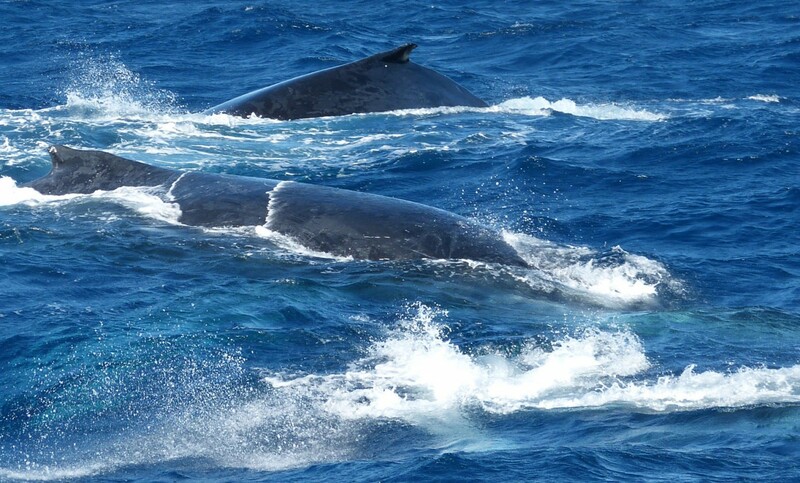 As the males nudged their fellow humpbacks to show who is the strongest they necessarily stayed close to the surface, tracking back and forth and circling in the vicinity of the boat, all before a backdrop of Surfers Paradise’s skyline in the near distance. A special moment on the annual migration of the humpback whales. The whale watching season extends from early June to early November as the humpbacks head north from their Antarctic feeding grounds to mate in the warmer waters off Queensland while the pregnant females from last season give birth in the seas around the Whitsundays before they return with their newborns south for the summer. If you’re planning a holiday or short break on the Gold Coast then we can help find you the right accommodation at https://www.visitqueensland.com.au/gold-coast-accommodation and a host of great Gold Coast activities and tours at https://www.visitqueensland.com.au/gold-coast-tours. The Best Apple Pie – EVER! Queensland’s Granite Belt in the southern border highland country is home to not only Queensland’s largest wine district, it’s also a fertile region for fruit and vegetables. Stanthorpe is rightly famous for its apple orchards but before you reach town take a turn off the main road along the gravel drive of Suttons and up to a big tin shed with a green door that doesn’t give away too much away of what you’ll find inside. Crates of bottled apple juice and shelves of cider and preserves line the corrugated iron walls. A handful of tables take up one corner of the shed with a counter and a display case that has the most temping apple pies you’re ever likely to find. The golden domes of baked shortcrust are filled to the brim with big juicy chunks of apple. 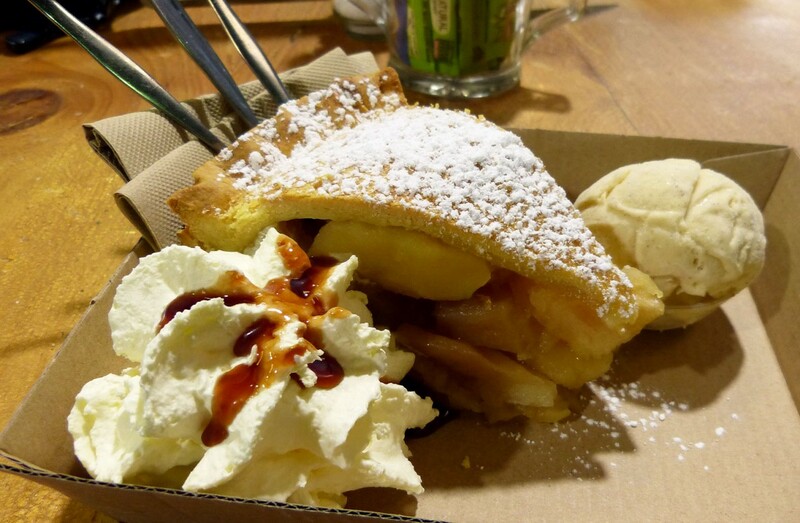 If you love an old fashioned apple pie like grandma used to make, dusted in icing sugar and served up with ice cream and whipped cream then this hidden treasure is well worth a stop before you start sampling the range of exceptional alternative wines that the Granite Belt has become famous for on its Strange Bird Wine Trail. Suttons is located next to the New England Highway just North of Stanthorpe at Thulimbah and is open daily from 9.30am to 4.30pm. No it’s not Naples or even New York. Mooloolaba on Queensland’s Sunshine Coast is generally known for having one of the best beaches in Australia but take a walk along the dining strip of Mooloolaba’s colourful Esplanade and you’ll come across Augello’s Ristorante & Pizzeria and… the World’s Best Pizza! The restaurant has been a regular winner at the Global Pizza Challenge, picking up awards for Best Pizza in Australia in 2014, ’16 and ’17 as well as the ‘Best Pizza on the Globe’ in 2012 and 2010. So which of the pizza are the big winners? In 2014 it was the Duck Sushizza that won ‘World’s Best Pizza’ with a rice base, teriyaki sauce, duck, parmesan cheese, sprouts salad, teriyaki aioli and orange segments. Sounds amazing but we tried Augello’s first big claim to fame with their 2010 world-beater, the Hot Smoked Salmon gourmet pizza. 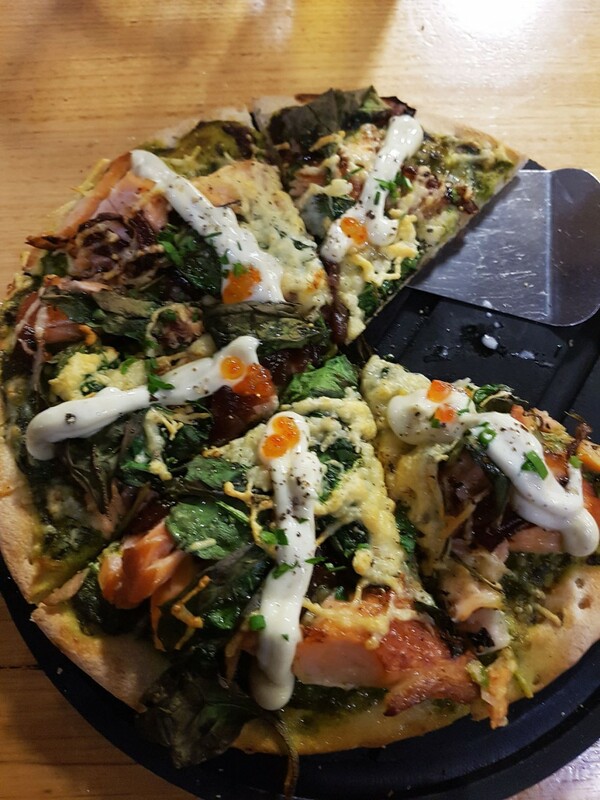 This absolutely delicious combination of hot smoked salmon (much tastier than the normal smoked salmon), dill and parmesan infused dough, salsa verde, baby spinach, onion jam, caper lemon juice aioli and salmon caviar is simply fabulous. If you love Italian food and especially pizza, Augello’s impressive list of award-winning gourmet offerings are definitely worth trying. And what a way to round off a perfect day on the beach at Mooloolaba on Queensland’s Sunshine Coast. The heritage precincts of Maryborough on Queensland’s Fraser Coast, is the setting for the annual Relish Food and Wine Festival to be held Saturday 2nd June. Relish is a celebration of the Fraser Coast’s fabulous seafood including delicious local scallops plus regional produce, cheeses, macadamias, all enjoyed with award-winning wines and craft beers. Now in its seventh year, Relish offers not only the chance to savour the best of local produce but also gain some new skills watching the master classes and workshops. This year includes camp over cooking guru, Ranger Nick, who will demonstrate how to cook a great meal with a camp oven on a small fire pit. Kenilworth Dairies will demonstrate how to make delicious dips using yoghurt while 2013 MKR winners Dan and Steph Mulheron will be showing festival crowds how to enjoy the region’s seafood and produce. The festival includes the Relish Long Lunch and guests can join the cruise along the Mary River for the ‘Bubbles on the Boat’. General entry tickets are available online for $10 or from the Visitor Information Centres in Hervey Bay and Maryborough ahead of the event or $15 at the gate. The cruise lunch and cooking classes are priced separately. Where better to enjoy tantalising food accompanied by fine wines than at one of Australia’s most appealing coastal holiday destinations – the stylish beach haven of Noosa on Queensland’s glorious Sunshine Coast. 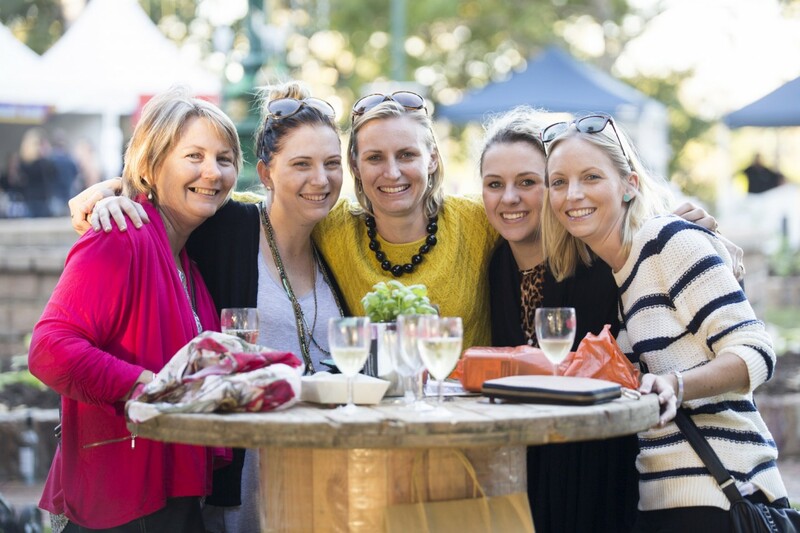 The festival runs over 4 days from Thursday 17th May to Sunday 20th May and comprises 35 events that features not only great produce but some of Australia’s best chefs with cooking demonstrations as well as master classes on wine and cheese appreciation. 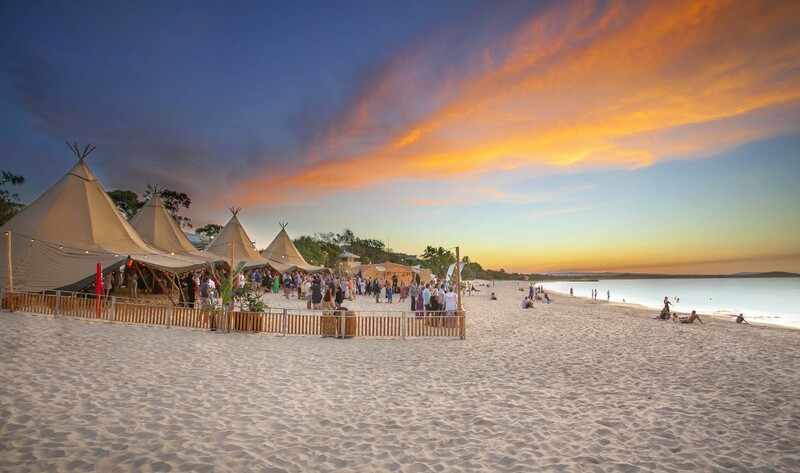 Highlight events include The Long Lunch on Hastings Street on 19th May while on the Friday night it’s down on the beach to the Tipis and the Noosa Food & Wine Festival Opening Party. Other events will be held at some of Noosa’s finest restaurants and there are culinary trails to explore including a Hinterland Trail, Slow Food Noosa Trail and the Noosa Brewery Trail. If food is your passion than give your tastebuds a treat! It might only be once every 3 years but Beef Australia is a major event when it comes to town in Rockhampton. Held from the 6th-12th of May, the week-long event celebrates all things beef providing a forum for the beef industry to assist trade and export along with seminars, property tours and a symposium. The expo features more than 30 breeds and 4,500 cattle. As well as the business of the beef industry there is plenty to see, taste and experience including a trade fair, plus a Who’s Who of celebrity chefs including Curtis Stone, Ben O’Donoghue, Jack Stein (Rick’s son), Matt Golinski, Adrian Richardson, Dominique Rizzo amongst others. 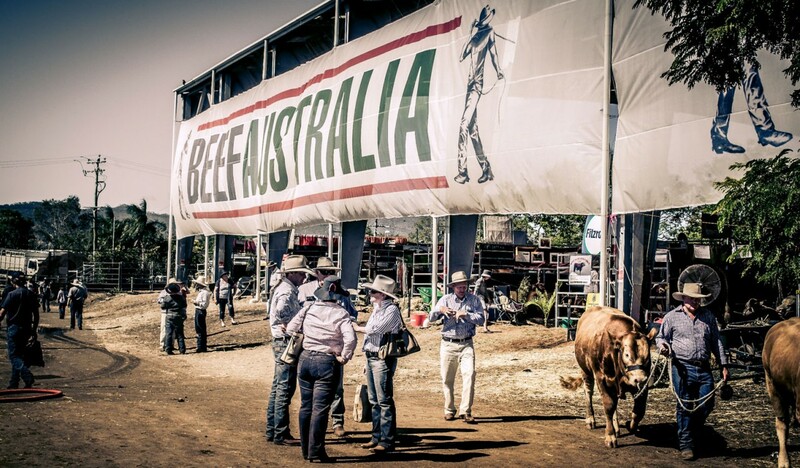 With social events, entertainment and a kid’s programme, Beef Australia is more than just a trade gathering. Maryborough’s annual World’s Greatest Pub Fest is on again on Sunday 6th May when literally thousands of oddly attired teams of enthusiastic drinkers will embark on the noble effort of visiting as many of Maryborough’s historic pubs in one – all in the name of charity and winning back its former status. The World’s Greatest Pub Fest was first held in Maryborough in 2005 with 1,198 participating pub crawlers and continued to set new world records over the next several years, warding off competition from London, New York and Halifax in Canada. In 2013 Maryborough set a new world record of 4,781 pub crawlers only be beaten by Kansas City the following year. Last year saw enough contestants to win back the world standing however, it seems not enough of them remembered to put in their cards at the end of the afternoon – or perhaps some just stayed at the last pub and forgot. Now national pride is at stake and Maryborough is calling for a winning crowd to restore its prestige of being home to the world’s biggest and greatest pub crawl. Contestants must first apply for an official Pub Fest Passport, which is not only an entry ticket but also the means of safely getting around by bus as well as your entry for the $1,000 prize draw and the contribution towards the year’s charity. Teams can get around on their own steam with a registered designated driver (Skipper) who’ll be offered free soft drinks at all of the Pub Fest venues. The heritage city of Maryborough boasts some exceptional colonial architecture and at its peak the city had some 40 pubs, many have survived to form part of the city’s impressive historic streetscapes. 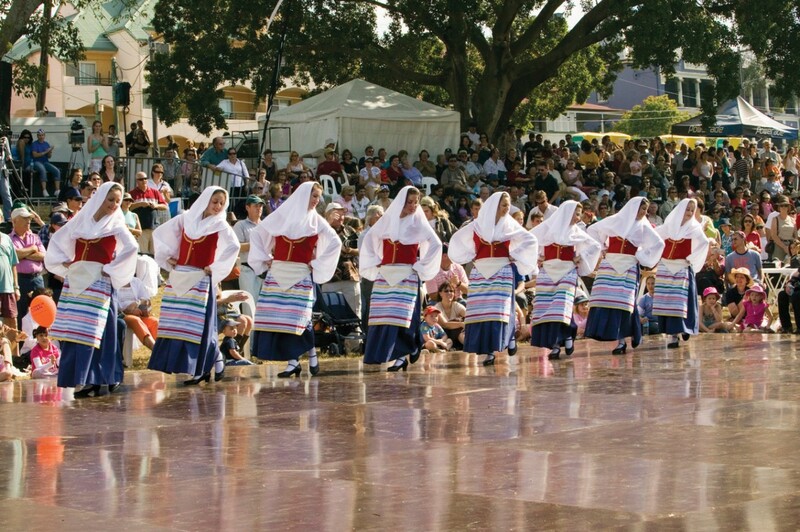 It’s the ideal setting for what is a colourful event attracting teams, groups of friends and participants of all ages (over the legal drinking age). Groups are encouraged to develop a team costume with prizes for the best teams under 5 members and over 5 members. Festivities get off with a bang as the midday cannon fires from the City Hall and the bells of St Paul’s can be heard across the precinct as strange looking teams head off to set a new world record. This year the World’s Greatest Pub Fest is in support of Assistance Dogs Australia. Reeling in a big barramundi is one of the great fishing experiences for any angler and the rewards continue when you cook up this prince of fish. 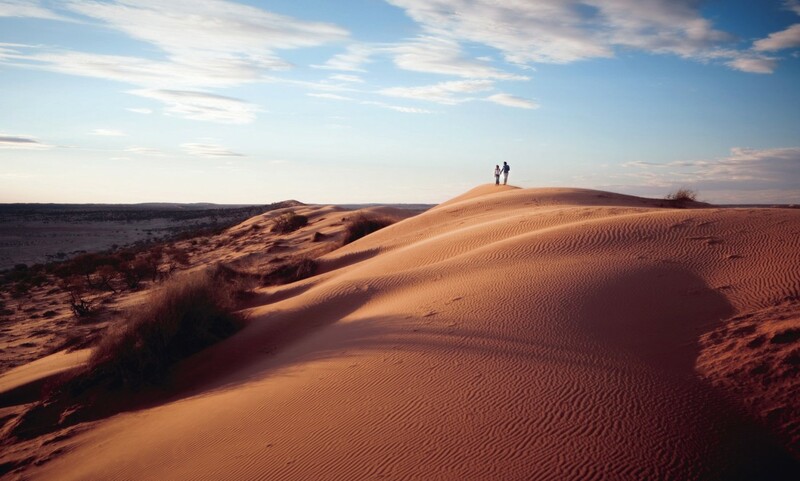 Seeking out the estuaries or stocked lakes and dams where barra are found can mean heading off the beaten track and camping, sometimes amongst the mozzies and sand flies in order to get to the big fish. If you like your creature comforts – good hotels, cafes with great coffee, restaurants and pubs famous for local steaks, and shops close by or you just like the convenience of being in a regional city then you can now enjoy some of the best barra fishing in Queensland in view of Rockhampton’s city centre. Anglers have been reeling in monster-sized barra of more than a metre in length in some cases from the city reaches of the Fitzroy River that runs through the heart of Rockhampton. So what’s made Rocky such a paradise for barra fishing? Commercial netting of the river ceased back in 2015 and as a net free zone the city stretch of river between the two bridges that span the Fitzroy has seen an increase both in barra numbers and sizes making Rockhampton an ideal spot for barra fishing. Some anglers will fish from tinnies or there are local fishing charter boats that make it a lot easier for anyone wanting a short break fishing weekend. You can even reel in a barra fishing from the riverbank thanks to new land-based fishing platforms giving recreational anglers the chance at catching a big barra. Coming to Southern Queensland but wanting a Great Barrier Reef experience? Fortunately, if your time is limited and you can’t get to Tropical North Queensland, you can still experience the wonders of this marine treasure including on day trip flights from Brisbane and the Gold Coast. Australia’s Great Barrier Reef was one of the first inclusions on UNESCO’s World Heritage list. One of the seven natural wonders, it stretches for 2,300km along the Queensland coast and comprises around 3,000 separate reefs together with 900 islands – 300 coral cays and 600 continental islands. It all begins on the tiny coral cay of Lady Elliot Island some 80km northeast of Bundaberg and just north of another World Heritage treasure, Fraser Island. The island is accessible for day excursions by air from mainland points including Bundaberg, Hervey Bay, Brisbane and the Gold Coast, or better still spend a few days discovering its treasures and staying at the island’s 41 room eco-resort. 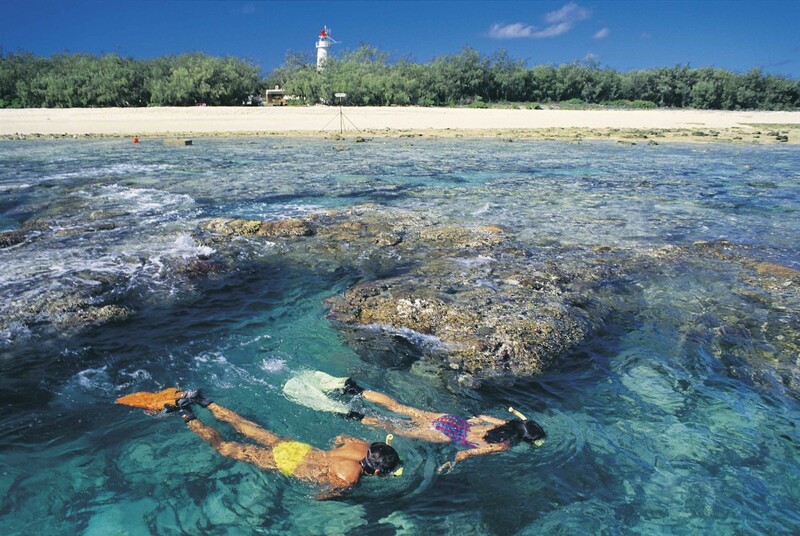 A trip here is special and the accent is on experiencing the wonder of the reef not on luxury resort holidays. You’ll stay in comfort whether it is in a glamping tent, an eco cabin, a reef unit or an island suite. There is a strong environmental ethos on the island generating solar energy, desalinating water, ceasing the sale of plastic water bottles and straws and educating visitors about the island’s ecology and the management has a target of 2020 in sight to be 100% sustainable. There is no mobile phone reception but WiFi is available and rather than TV you have the whole of the Milky Way to enjoy at night. Lady Elliot is one of just a handful of coral cays with a resort and the only one to have an airstrip making it possible for fixed wing light aircraft to reach the island. From the air the green wooded island encircled by white coral shores and brilliant aquamarine shallows looks to have had the airstrip carved through the centre. In fact during Victorian times the island was effectively razed by guano miners. They collected the metre deep of nitrogen rich bird droppings that had built up over 3,500 years. The decade of mining from 1863 had left the island denuded of all but a few pisonia trees until a century later in 1969 local aviator, Don Adams, set about creating the airstrip and revegetating the island. Today it is a protected seabird and turtle rookery with casuarina and pisonia trees covering much of the island. Coral cays are formed from the gradual build up of broken coral till an island emerges and eventually establishes vegetation. Because it is part of the reef you can step out from your accommodation and be wading in the shallows or snorkelling amongst the corals within moments. These are amongst the most pristine coral gardens of the Great Barrier Reef and Lady Elliot is famous for its manta rays – those graceful creatures with their broad wings that glide through the clear waters. Diving and snorkelling amongst the corals with the mantas and turtles and an array of brilliantly coloured fish is an unforgettable experience. If it’s your first time on the reef to get acquainted with the island’s marine life it’s worth starting with a guided reef walk and one of the glass-bottom boat tours. It all gets too tempting, however, and you’ll want to hire a snorkel and fins and start discovering or go on one of the dives (only for those staying – no diving for those flying the same day). There are bird watching tours and historical tours or head off to walk around the island – at just 45 hectares you can’t get lost and the walk will take you around 30 minutes. Come nightfall there is the convivial company at the bar and the challenges of quiz, bingo and games nights while outside there is star-gazing and night glass bottom boat tours – night time is when the reef really comes alive. During turtle season from November to February the island’s shores become the nesting grounds for green and loggerhead turtles. Some turtles travel vast distances to return to these shores to nest. The guided night tours ensure the turtles aren’t disturbed but guests can still experience a wonder of nature, especially in late summer when the hatchlings emerge from their sandy nest and scramble to the edge of the water. It’s part of a remarkable encounter with nature at a very special coral cay – the southern anchor of the Great Barrier Reef and just a day trip flight away for visitors to Southern Queensland. The magnificent manta rays of Lady Elliot Island now have their own craft beer named after them, Ray XPA brewed by the Bargara Brewing Company. The beer, which has a manta ray on the label is a joint initiative of the brewer based in the Bundaberg Region and Lady Elliot Island as each label also draws attention to Project Manta. The scientific program which began in 2007 continues to monitor manta ray population and behaviour along Australia’s east coast, with a particular focus on locations of high aggregation such as Lady Elliot Island. So, visitors can enjoy a local drop while being encouraged to support research of the Great Barrier Reef and the manta rays. While the shores of Noosa Main Beach never lose their appeal, an alternative to this popular beach spot lies close by further out on the peninsular at Noosa National Park. It’s worth knowing the car park here can be challenging and quickly fills up so consider walking from Noosa which has parking areas near the river. The walk from Noosa Main Beach is under 10 minutes and well worth the effort with fantastic views back to Noosa and along the way the almost hidden Little Cove before you arrive at the National Park. If you were lucky enough to find a spot then there are picnic tables and barbecues after you’ve explored the walks and beaches. Keep an eye out for the wildlife near to the entrance of the park as you might just spot a friendly python near the tracks or a koala up in the eucalypts – the wildlife including a fantastic array of birds from honeyeaters to ospreys clearly love the seaside location just as much as humans. The first stop is Boiling Pot Lookout where the surging waves fill the rock pools and you get a great view of the beach and dunes across the estuary at Noosa Northshore. The track rises and winds around the steep banks with glimpses of Tea Tree Beach and the glistening waves appearing through the trees. This is a great beach to make camp for the day with shady spots either set back from the rocky shelf on the western side or from the sandy beach on the eastern side. Find a patch of shade under a pandanus or casuarina tree to claim and take in the view and the fabulously fresh sea air. There are shallow rock pools to explore, sand for building castles, and the sea is calm and inviting or just sit back and watch the board riders picking up the point breaks off to the east. From the beach the track winds and ascends to Dolphin Point Lookout. It’s well named and with a keen eye you can often spot pods of bottlenose dolphins not too far offshore as they transit around the peninsular. Come the winter migration season of the humpback whales, this is also one of the best spots for watching the pods of mighty whales heading north and then in spring you can see them on their return journey to the feeding waters of Antarctica. Continuing along the Coastal Track, the pathway narrows as it hugs the edge of the high banks above Granite Bay. A separate path leads down to a patch of beach or if you prefer a secluded cove all to yourself and if you’re prepared to scramble down the rugged track then Winch Cove could be your picnic home for the day. The nearby point is definitely worth exploring. Fairy Pools offers up the secrets of crystal clear rock pools that are deep enough to retain fish during the low tides and are home to anenomes, crabs and sea urchins. From Fairy Pools the grassy windswept cliff tops with the occasional pandanus make good viewing points for surveying the waters for more dolphins or just to watch the waves crashing against the rocky shores. Those waves get ever more dramatic just around the corner at Hell’s Gates. It’s a long drop down from the cliff edges here so caution is needed, especially with children, but the view can be spectacular as the waves drive deep into the gorge and send a plume of spray into the air. The Tanglewood Track connects from here with the Coastal Track and to the south is a broad span of white sandy beach backed by bushland. Alexandria Bay isn’t accessible by road and not overlooked by buildings so it offers a real taste of wilderness shoreline, tucked away in the National Park. At the southern end of the beach is another headland and as if to flank Hell’s Gates, another gorge – Devil’s Kitchen – marks this second headland along with Cook’s Monument. 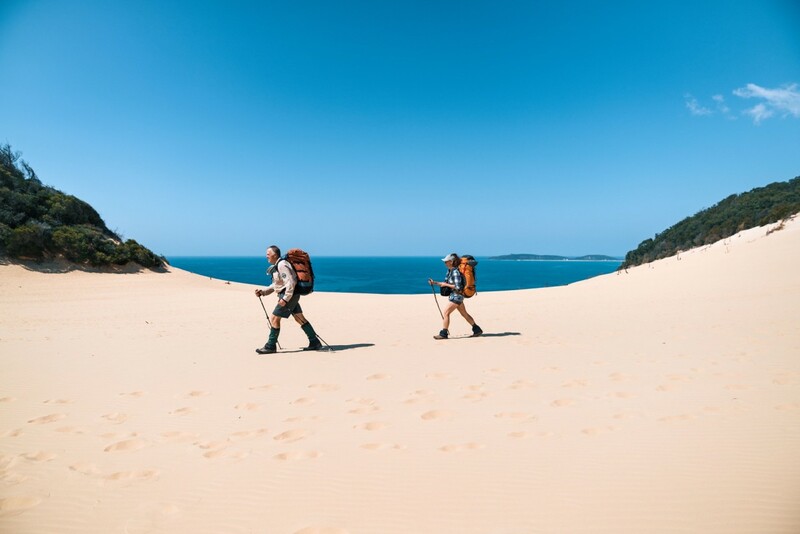 The track winds around to the lookout above Sunshine Beach or you could head back to the start of the National Park retracing your steps or following one of several bushland tracks including part of the Tanglewood Track which offers a shortcut back to Granite Bay. 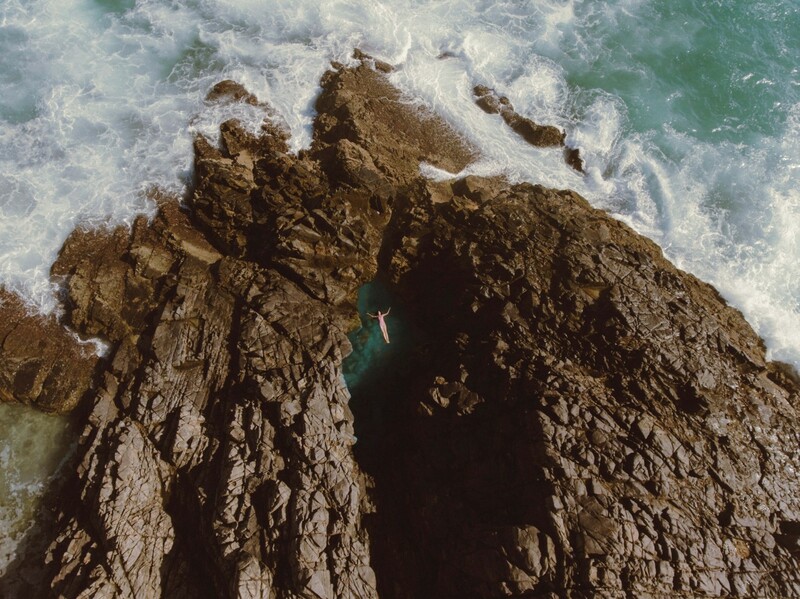 There is much to see and enjoy in Noosa National Park, whether it be for a swim at Tea Tree Bay or spending an adventure filled day exploring this special corner of the Sunshine Coast. 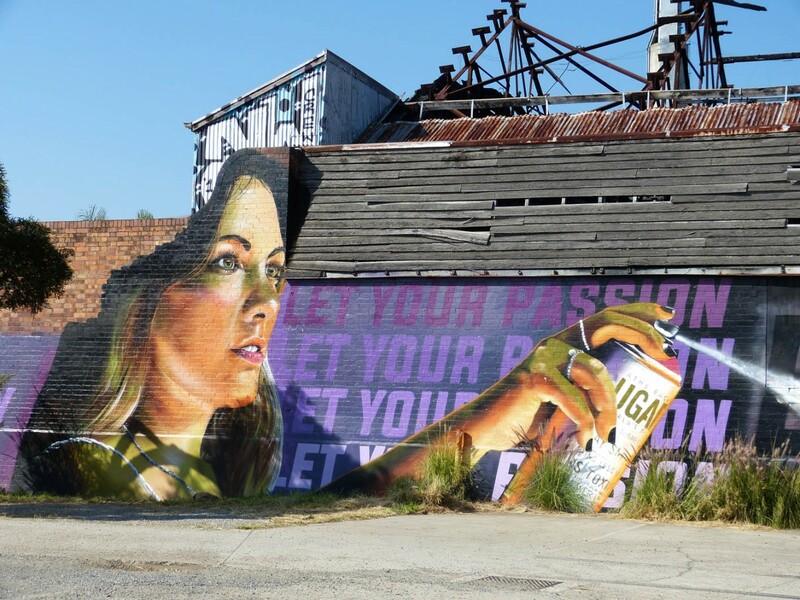 Brisbane’s art scene has turned to the streets in recent years with some stunning murals appearing on the sides of buildings, empty walls, under bridges, on pavements, cycleways and down laneways. The murals aren’t graffiti but commissioned or permitted street paintings that show some extraordinary talent and imagination. The artistic styles range widely from edgy surrealist imaginings to realist paintings, others with strong symbolic or political statements while yet others choose to be witty commentaries – in fact the styles of paintings are so broad as to defy an all embracing description other than they are public pieces, urban art on display for anyone who seeks them out or encounters them while traversing the inner city. The street art phenomena now enhances locations in the suburbs ringing the city centre, most especially in Fortitude Valley but also in neighbouring New Farm and Spring Hill, across the river in West End and South Brisbane and more in Paddington and Milton. Seeking out the venues provides an entertaining way of exploring some of the corners of the inner city precincts with new pieces appearing all the time that add to Brisbane’s street art culture. Some businesses around the Valley have had the vision to recognise how embellishing their building with works by gifted muralists can turn their businesses into local landmarks. Tryp Hotel in Constance Street exemplifies how the right street art can help make your business very cool, from the face imprinted across the front of the hotel to the climbing backpacker on one exterior wall and even the mural of a cloudy sky in the glass-sided lift, this hotel attracts visitors who’ve discovered the art. Looking for an autumn escape with long sandy beaches, clear waters and temperatures just made for beachcombing? Queensland’s Sunshine Coast begins just a 40minute drive north of Brisbane Airport and offers some of Australia’s best beaches along a coastline that stretches for over 100km. There is such a diversity of choice on offer here that you can definitely find your personal ideal of what a beach should be. That might be anything from a colourful and popular surf beach at a popular holiday hub with a great vibe, good waves, lots of cafes and refreshments close by or perhaps you’d prefer just an endless stretch of untamed shores away from the crowds where you could walk seemingly forever. The Sunshine Coast offers each of those options plus great spots for surfers, young families, secluded coves where you can feel like a castaway for a day and river estuaries ideal for getting in some watersports like paddle-boarding and kayaking. Two of the Sunshine Coast beaches that regularly feature in the top 10 with people’s choice surveys are Mooloolaba Beach in the southern half of the coast and Noosa Main Beach in the northern half. Not only do these both tick the boxes for being fantastic beaches, both are north facing or in the case of Mooloolaba part of this sweeping crescent is north facing and thereby protected from the south-easterly breezes that can whip up the waves. These two beaches along with the also north facing Tea Tree Beach in Noosa National Park, offer generally calm waters and are ideal for young families getting used to the sea. The points or headlands that help protect these beaches ironically provide the breaks that surfboard riders are seeking and in places such as Tea Tree Beach you can enjoy the calm ripples near the shore while watching the board-riders perform on the point breaks further offshore. If you’re a dedicated surfer discovering the Sunshine Coast for the first time then you’ll find excellent point breaks at The Rock at Point Cartwright, Moffat Point near Caloundra and in Noosa National Park at First Point which looks back to Noosa Main Beach, Tea Tree Bay and Granite Bay. For good beach breaks head for Kings Beach at Caloundra, Mooloolaba, Buddina and Alexandra Bay. Coolum is the start of a long unbroken stretch of beach with beautiful sandy shores that continue to Perigian, Marcus, Castaway, Sunrise and Sunshine Beaches ending at a headland with just over 200 steps to the top and a view that takes in all of the span of the beaches to the south. This stretch of coastline has some of the most exclusive and expensive beach houses in Australia that overlook a coastline that seems to have a constant parade of people out for a walk. The rocky headland at the southern end of Coolum offers up a few secluded patches of sand cradled by the rocky cliffs. They make good spots for a peaceful day away from the bustle of the main beaches. And if you enjoy natural settings then Noosa National Park is a must with Tea Tree Beach, the rocky boulders of Granite Bay, tiny Winch Cove and for the energetic the walk beyond Hell’s Gates takes you to the spectacular pristine Alexandria Bay. For those who enjoy watersports including kayaking and paddle-boarding the estuaries and channels of the Sunshine Coast provide an ideal playground starting with the blue waters of Pumicestone Passage – a picturesque channel that divides Bribie Island from the mainland and arcs around to Bulcock Beach at Caloundra. 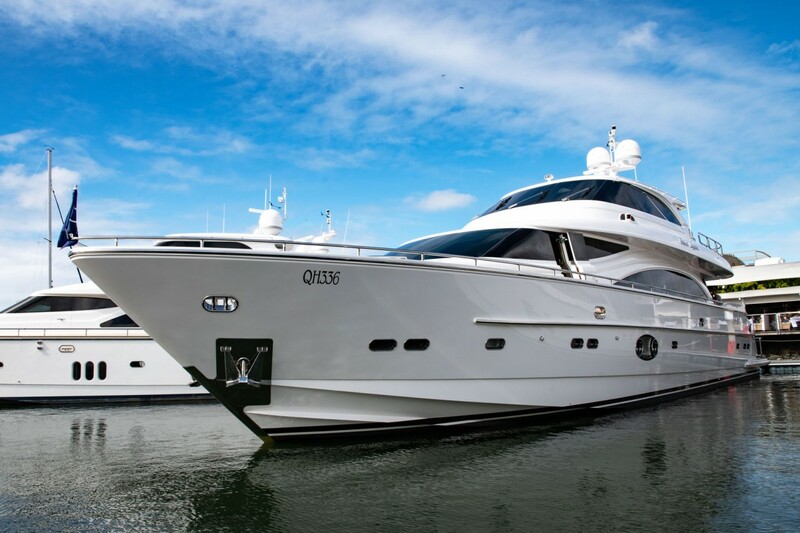 The Maroochy River is also ideal for watersports and perhaps the most popular of all is Noosaville on a stretch of the Noosa River close to the estuary. The parkland riverfront is filled with boatsheds hiring dinghies, pontoons, kayaks and paddle-boards making a colourful scene of water bound activity. There are a lot more beaches to discover but whichever ones along the beautiful Sunshine Coast you choose remember to only bathe between the flags and use sunscreen. Happy beachcombing. To check on whether a beach you’d like to visit is patrolled and when the Life Savers operate then visit www.beachsafe.org.au or download the app. It provides details of the patrol times for each beach and all of the relevant beach conditions for that day from weather and water temperature to how big the surf swell will be, wind speeds, tides and UV index. It’s the perfect companion for beachgoers.